Sefton Central Labour MP Bill Esterson has welcomed news that the Thornton relief road will finally be opened next month. The long-awaited road will formerly be named A5758 Broom’s Cross Road and opened on August 6. Bill Esterson MP said the road marks a victory for residents. 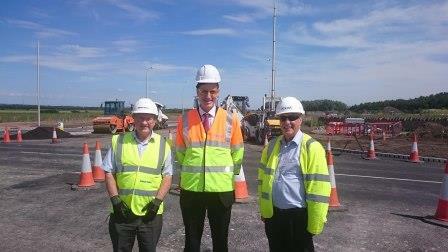 Bill said: “The Thornton relief road has been a long time coming, but we are very nearly there. “When the work is complete and the road is opened on August 6 it will be the culmination of many years of work. “Not just the many years of work from the contractors who have built the road itself, but even more years of campaigning from residents and councillors. “Despite getting close to the finish line many times in the past, it was the determination of these campaigners who finally brought this plan to fruition. “When in 2010 the government announced that the scheme had been shelved, I took up the cudgels to push ministers into realising how vital this road is for the infrastructure of the whole of Sefton and vital investment for the whole region. “Thankfully, with the weight of a 40 year campaign, added together with pressure from residents, parish councils and borough councillors, we were able to get the scheme back on the agenda and the road built. Congratulations also to Sefton Council for part-funding the road as without local cash, the government would have said no. Bill said the investment in Broom’s Cross Road will be felt in Sefton for generations. Bill said: “I have argued with George Osborne and David Cameron in the Commons that we need to see investment in Sefton and throughout the region. We need that investment to create the jobs that we need and to help local businesses to thrive. “This new road creates the links to the motorways that people in the north of the borough need to do business and to get to and from work and it also gives businesses the chance to get new customers. “But as well as that, it will alleviate the congestion that the people of Thornton have been living with for far too many years and which motorists and commuters have been having to contend with day in and day out.